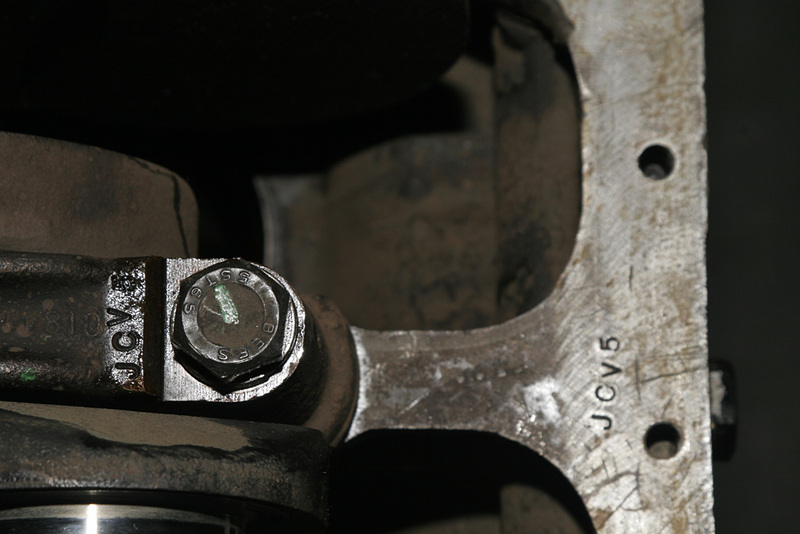 Having repaired the Jaguar 4.2 block with the Lock-N-Stitch process, assembly could begin from the bottom up. 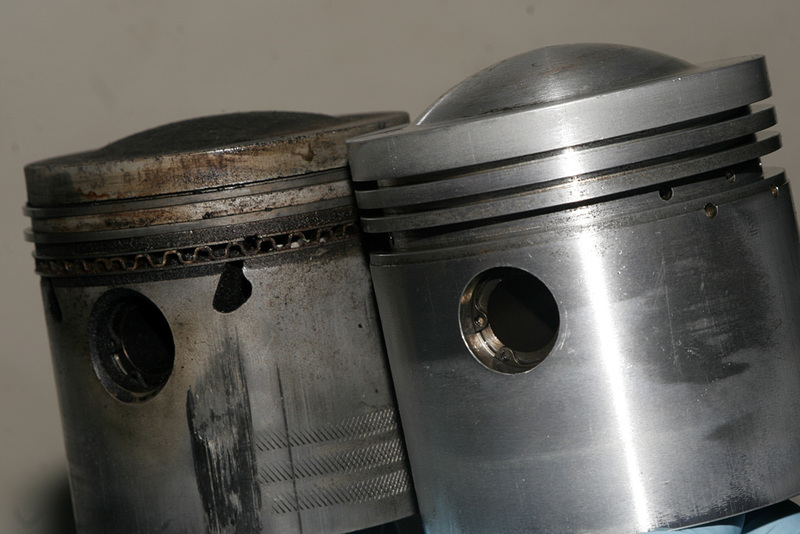 The first step was to hone the cylinders and ensure a smooth surface for the piston rings. 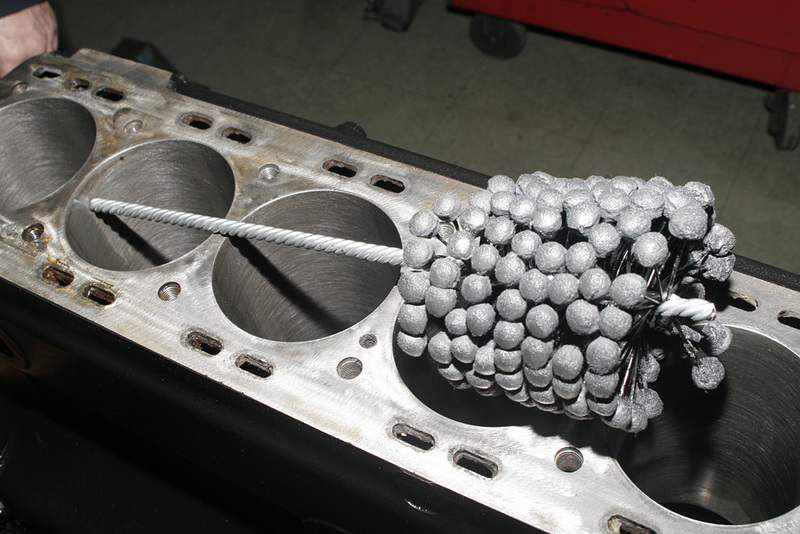 With some oil applied to the abrasive stones each cylinder got around 20 to 30 strokes. This engine shows signs it has been apart before. Aside from the factory labels of JVC1 through JVC7, several other marks were on the block. Typical of airplane construction, JVC1 was closest to the firewall. 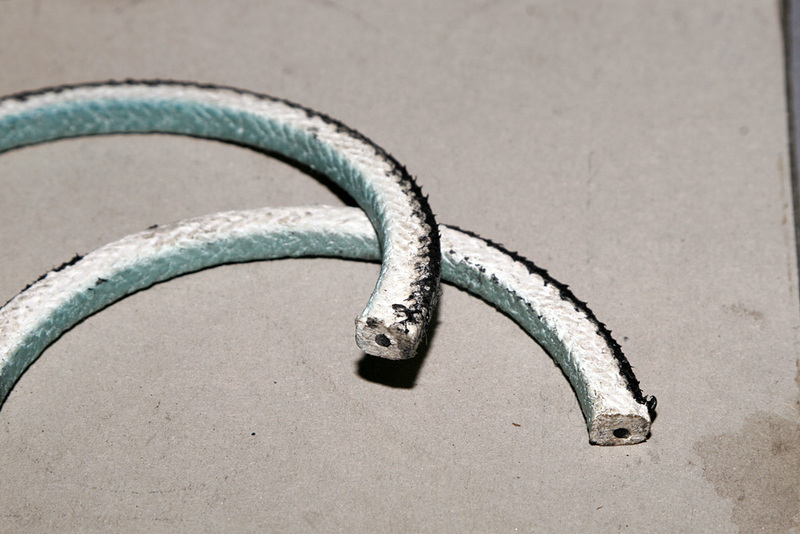 The first step was to fit a rope seal which needs to be evenly pressed into place. 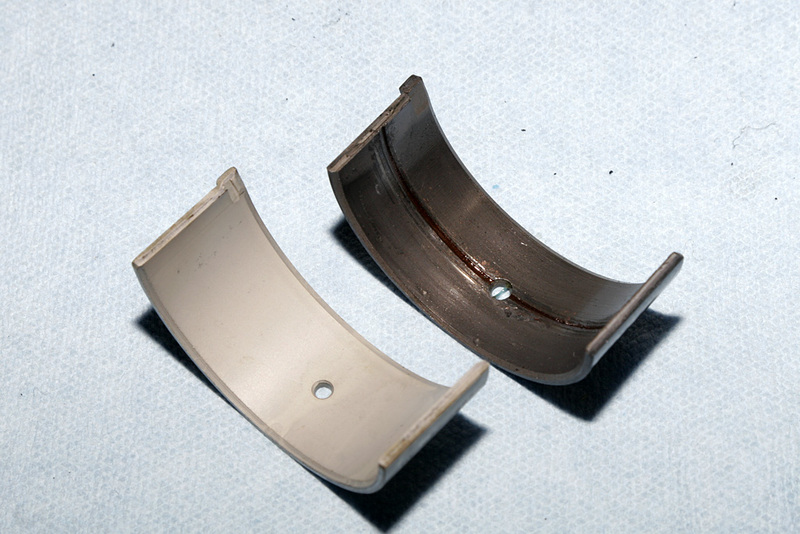 These two-peice seals create a tight fit because the inner surface of the seal is rubber which expands when exposed to oil. 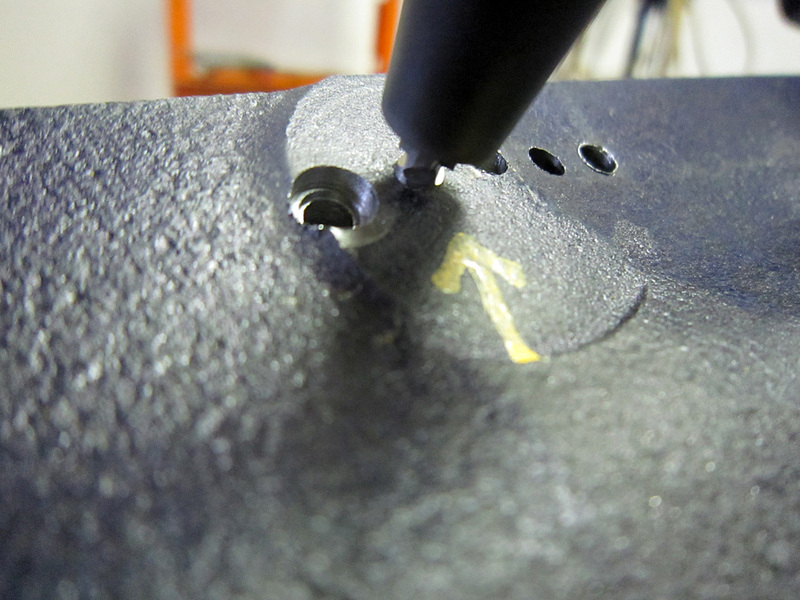 Installation was done with a unique tool with a tapered surface that expanded the seal into place. A fitting on the end of the tool let us rotate the tool to avoid any binding. Next the bearing clearances were tested with the main bearing caps fully torqued. 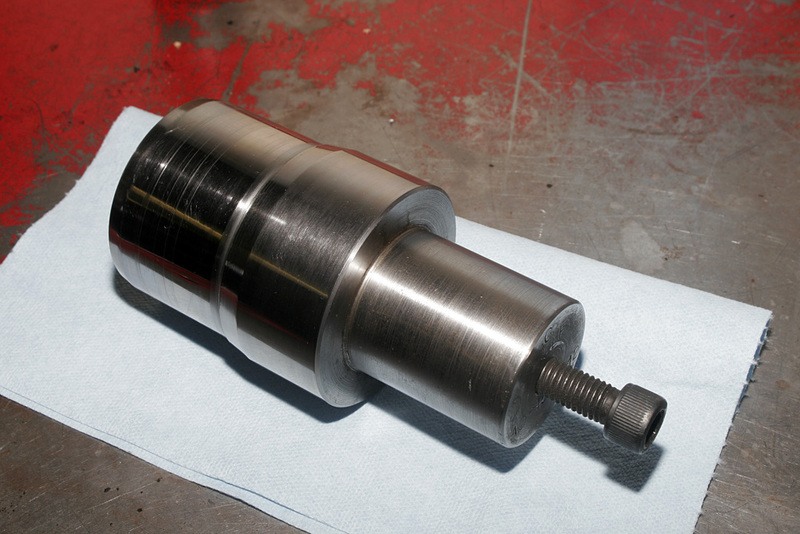 After establishing good clearance (.002 shown), the 75 lbs crankshaft could be permanently installed with new bearings and thrust washers. Not long afterward the end play of the crankshaft was measured using a dial gauge which was magnetically fastened to the block. Typical play is .002 to .003 to a maximum of .005. If the end play was too much, oversize thrust washers would be needed. Finally, distributor drive spindle was fitted using a modified distributor. 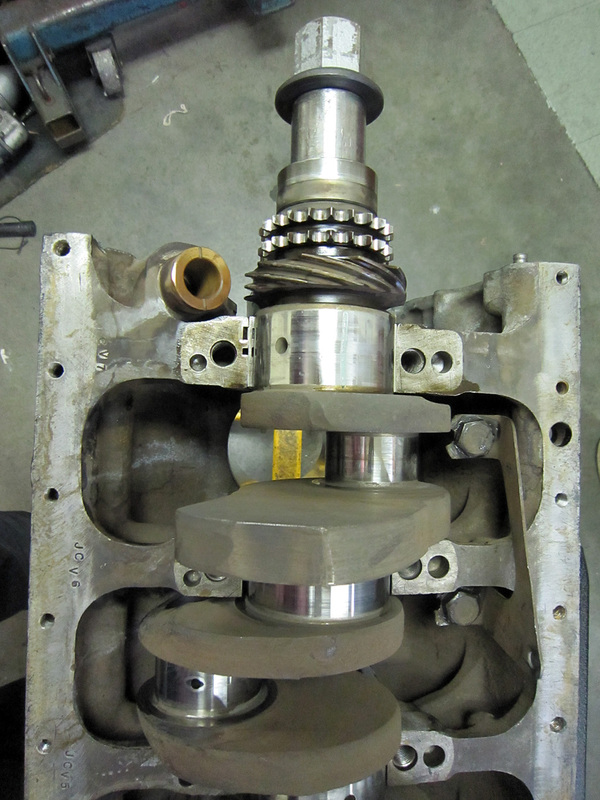 This ensured that the torque wasn’t applied to the gears and instead the linkage of the distributor. This week a gentleman dropped by with special Jaguar that is a very rare sight in North America. What he had was an XJ-S with modifications by Tom Walkinshaw Racing (TWR) who was responsible for developing the Jaguar Sport Group A racecar. 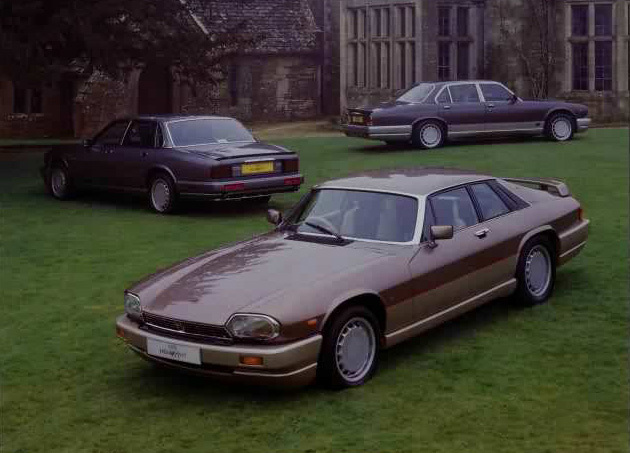 The project was fairly atypical of other cars in Group A in that the XJ-S was more a luxurious grand tourer than anything else. None the less, Tom Walkinshaw won the driver’s championship in 1984 and the coveted 24-Hours of SPA in the same. Capitalizing on these victories, TWR offered a compressive program to tune XJ-S far above its intended performance potential. The Basic package included TWR wheels with Goodyear NCT tires, a comprehensive suspension kit that lowered the car, a race-inspired steering wheel, a new power steering valve that lowered the power steering effect and a purposeful body kit. For those wanted even more, TWR could retrim the interior and recoat all the chrome in black or body color. 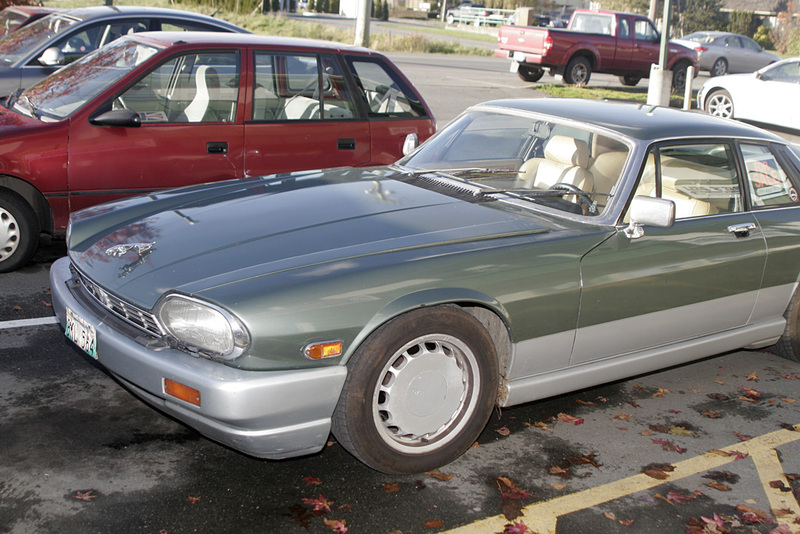 Exclusive to the V12 XJ-S program was an ‘Engine Efficiency Kit’ which included a high-flow intake and exhaust. The automatic gearbox could also be fitted with a quick shift kit and a new lever. For even more serious customers with deep pockets, a 5-Speed Manual could be fitted and a 6.0-liter engine conversion not too far off the racing program was available which produced 380 bhp. The car which dropped by appeared to have many of the upgrades including a two-tone paint scheme that was typical of these cars. The owner didn’t know the extent of the TWR modifications, but he just completed a epic drive from Manitoba to the west coast of Canada. It showed typical signs of 224000 kms. 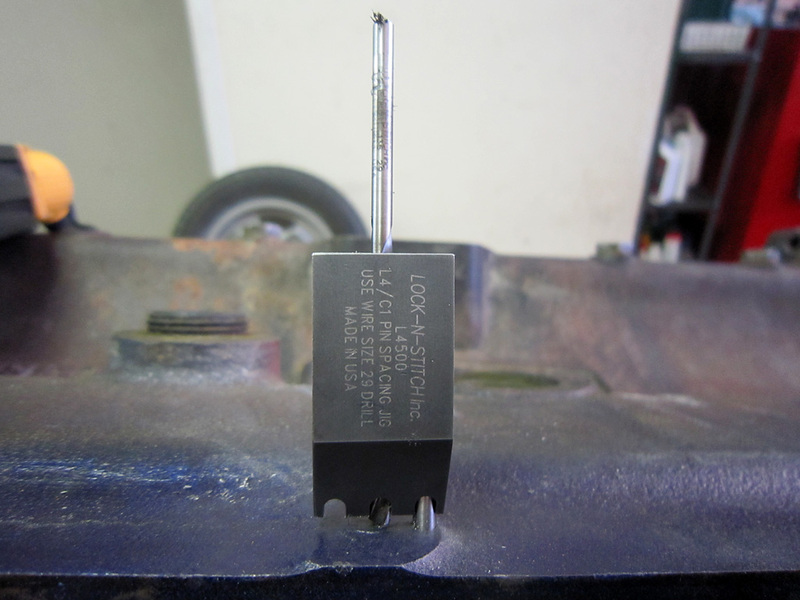 Having received all the necessary tools and supplies from Lock-N-Stitch in Turlock, California, we could begin the process of repairing our Jaguar 4.2 block. The company provides an informative DVD that explains all the steps and options which is essential. The basic idea is to replace the crack with a linear line of screws and begins with a single drill hole that will is placed well beyond the crack to ensure strength. The above photos show the Lock-n-Stitch spacer which inserts into the first drill hole and lines up the drill bit for the next cut. The tool isn’t completely necessary, but it organizes the holes neatly and ensures proper distances between screws. For the first run, only every second screw is inserted. The holes are then countersunk with a spot face bit that will cut a controlled shoulder for the screws. 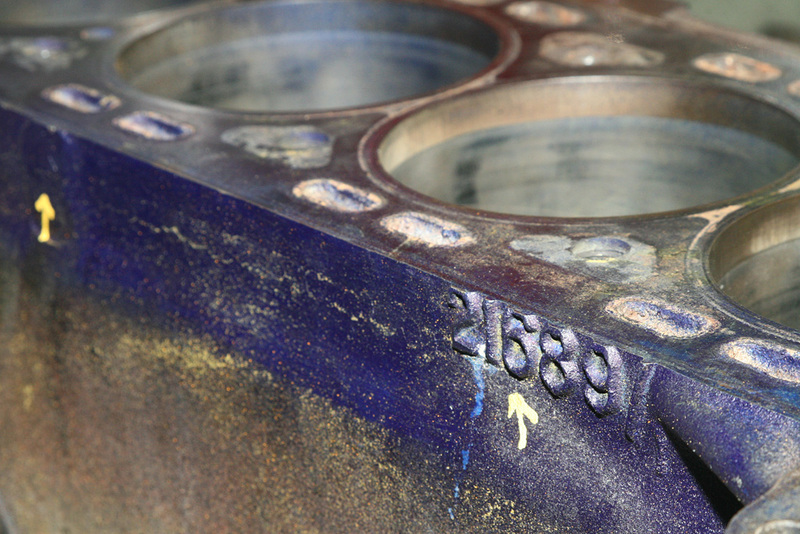 The spot face distance is critical and depends on the wall thickness and thread distance. 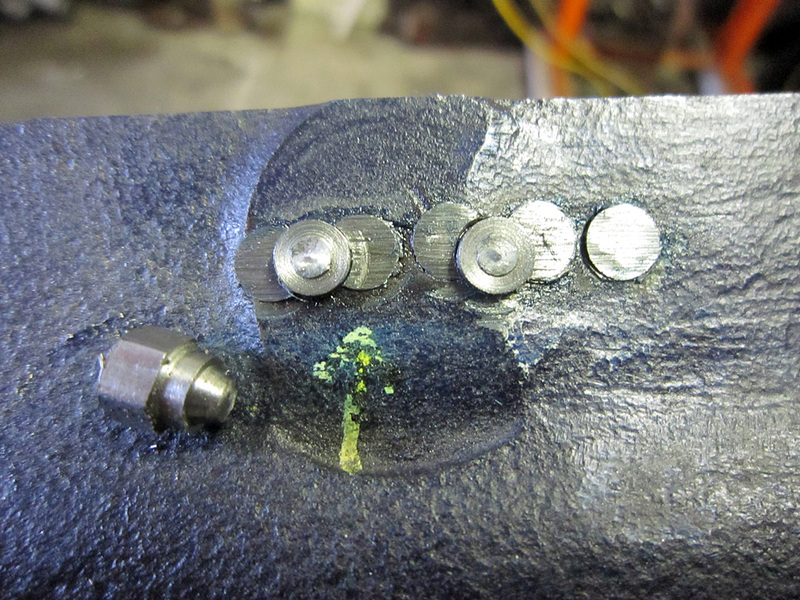 The first set of cascading drill holes are then threaded and the pins/screws are inserted permanently into the block with thread sealant. The screw is simply wound into the block until the breakaway head shears off. The remaining stubs are then ground down so the gaps inbetween the screws can now be filled with the second series of screws. The following picture shows the second line of pins being inserted with the breakaway top of a single screw resting on the block. 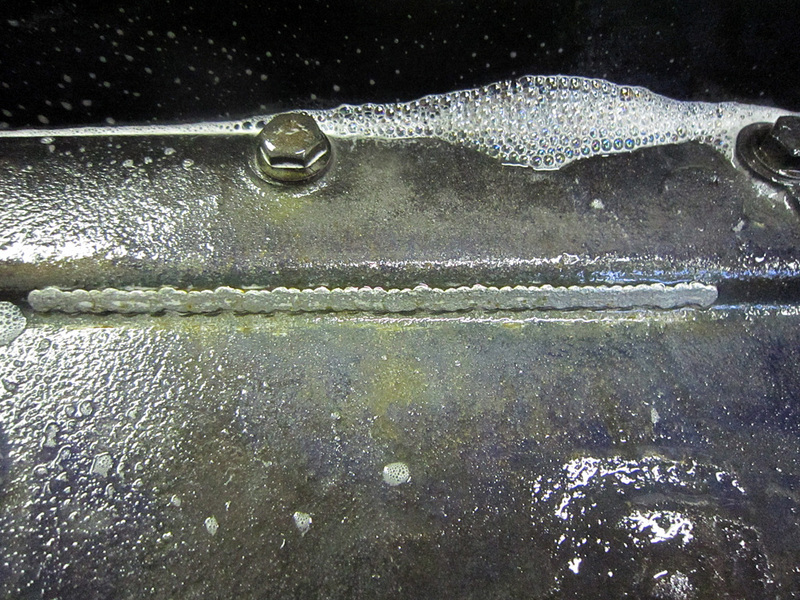 After the complete line is finished a needle scaler was used to replicate the rough finish of the block. The end of the screws were left slightly protruding to retain as much strength as possible. The following picture shows the needle scaler and a finished line which was pressure tested to 10psi for leaks. Since no bubbles were visible from the pressure test we can now begin assembly of the 4.2 engine from the bottom up. Below is Lock-N-Stitch’s own promo video for their product. Here’s an example of the force that frozen water can have on an otherwise robust cast-iron block. 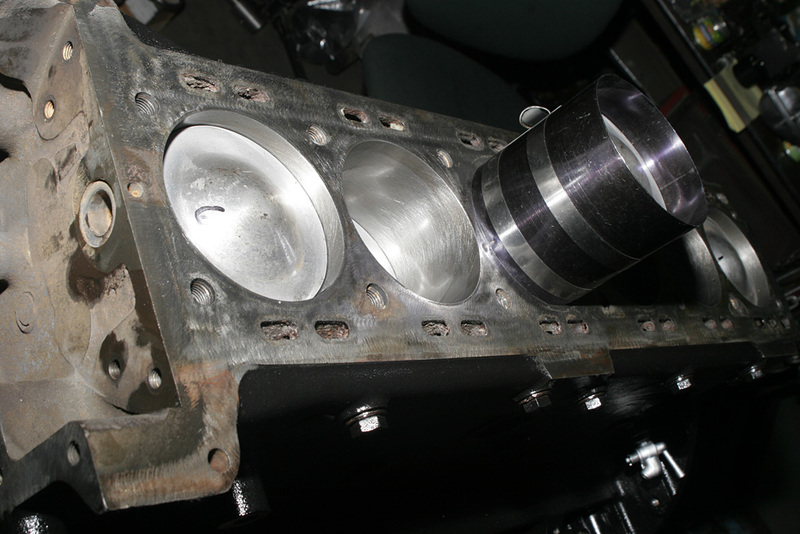 The pictures show a Jaguar 4.2-liter block from an E-Type that has been recently magnafluxed. According to Wikipedia, this process creates a magnetic field around the block which “will cause a high concentration of magnetic flux at surface cracks, which can be made visible by dusting iron powder”. In this case the problem area was painted blue and dusted with yellow iron oxide particles that easily show cracks at the surface. The results show the weakest point of the water jacket around the block deck. The cracks are the direct result of water expanding during freezing. 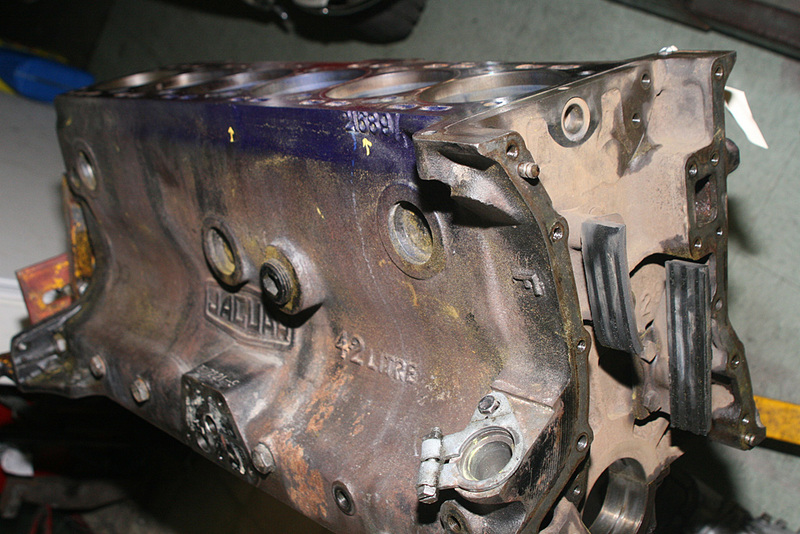 As this engine belongs to a matching-numbers car, the block will need to be repaired vs replaced. This will require a metal stitching process since a straight-forward weld can further crack the block as the weld cools. To successfully make an electric weld, the entire block would need to be preheated somewhere from 900º to 1500° which isn’t feasible. 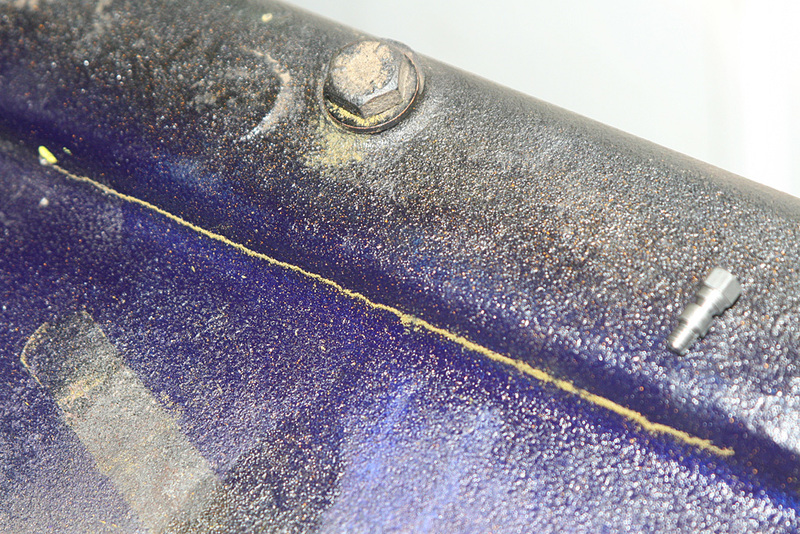 The following pictures show definite cracks along the top of the water jacket. 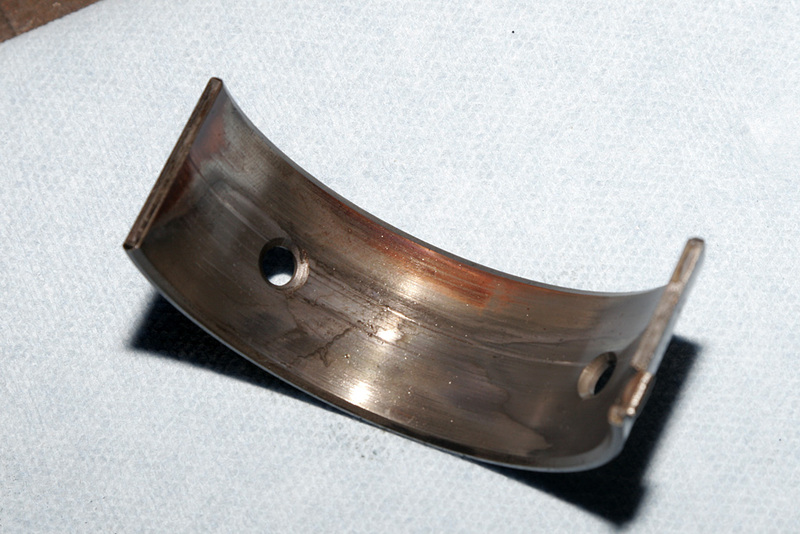 The first image shows signs of a previous metal stitching process and the circular pins that replaced the crack are only visible from the Magnaflux process. Either this fix caused crack to extend or the previous repair didn’t cover the entire crack; there is a noticeable seam beyond the pins which extends to the yellow arrows. Some versions of the lock & stitch fix include expanded bolts which can further stress the area. To prevent this we will use the Lock-N-Stitch Inc’s C1 pins that do not expand. The opposite side of the block also has crack which is unrepaired and will require the same process. The last picture shows one of the C-Series pins next to the crack it will eventually replace. Further posts will show the compete build of the Jaguar 4.2 including a detailed look at the Lock & Stitch process.